When we first moved into the house the number one priority was curtains. But I could never find prints I really wanted myself so I knew from day 1 I would have to make them myself. Just as a reminder – I have one very very large window in the living room (17 feet long!). and then I have one window that is connected in the dinning room. So I needed an economical solution for the 17ft window on the curtain rod. If I bought a curtain rod in the store it would be so expensive. So instead I bought a 20 foot copper pipe. Yep a 20ft pipe! Then I jazzed it up with fun Restoration Hardware ends. I like that it mixed copper and brass and it was economical! The curtains make the whole space so full and homey. A difficult thing to do in the living room, is balancing the practically of cozy TV time and the aesthetic need to make your living room look pretty. This being our first house, it’s small and we don’t have a tv and a formal living room. So we have to combine our area. 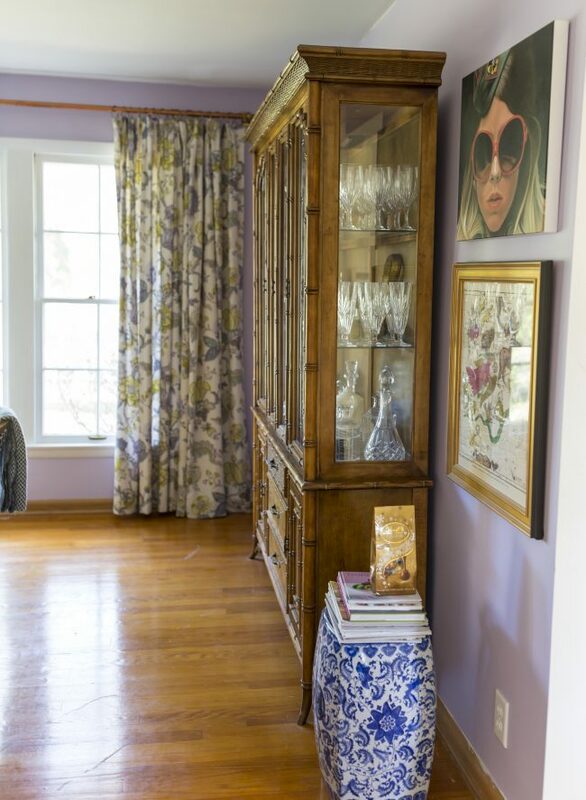 A great way to do that is to hide it with a great gallery wall. 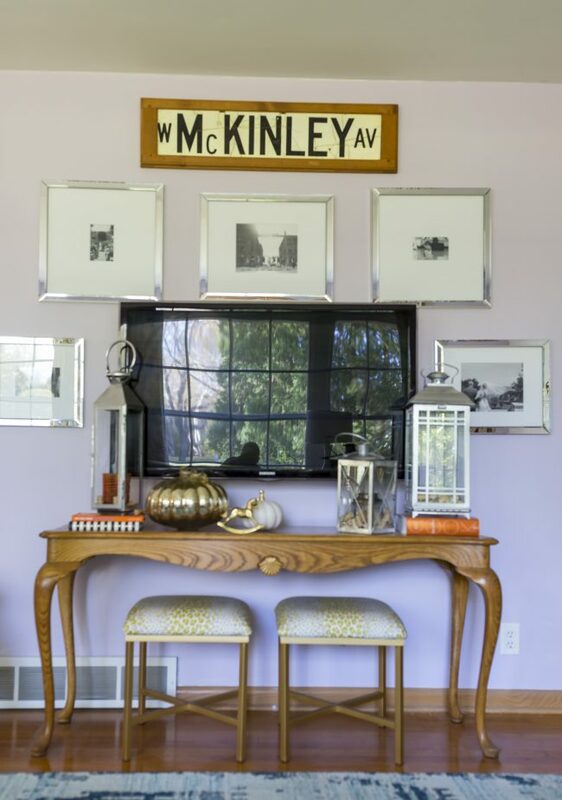 The other thing I love doing is tucking ottomans under a console table. It’s a perfectly practical way to add two more spots to sit. These two ottomans I bought from target and easily re-upholstered the cushions to make them fit in our colors. We are often having a lot of guests over for the extra ottomans are also an added bonus for that! My apologies for the late post. I took the pics right before we switched over to our holiday decor! 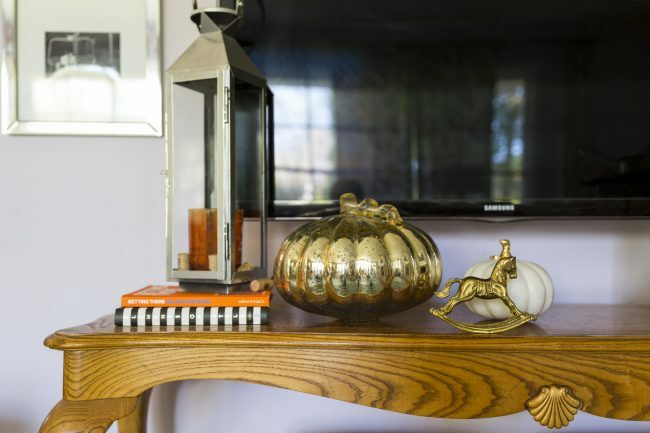 But overall another way I conceal the TV is by hiding fun accessories around the console. This console was a great find too! Craigslist $80, and it didn’t even need any updating!!! Just as a reminder. This is what it looked like when we moved in. And this was when it looked like when we first re-did the mantel. See the DIY Mantel Post here, and here. I liked the way we did the mantel at first. But there is just something about really big art that brings a level of sophistication to a room. So I got an itch to try and do a DIY piece of art. I first found the below inspiration and knew I wanted to try and re-create. It was from the HGTV Smart Home in North Carolina Last year. I love how sophisticated the large piece of art made the whole room feel. So, with the help of my husband we gave it a whirl. Making the art was super fun. I pulled my husband in, he was a double major in multi-media and fine art in college. So he was a huge help in the process. I love the crisp blue tones with the white and the pop of green. Can’t wait to decorate the mantel for Christmas!!! Thought I would pull together some past table to draw inspiration for fall dinner parties coming up! This table was from last year. I just loved the flowers – I incorporated fruit. See the full post here. Loved the pop of orange here. See full post here. These two were from a friends giving my good friend Mary Hosted. Love the way she playfully mixed the fabrics! See the post here. 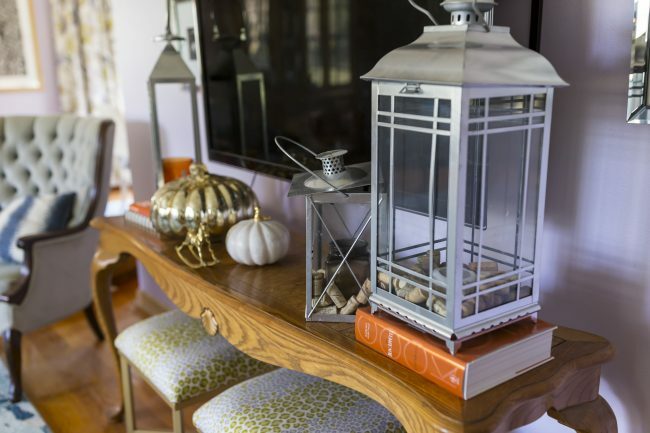 How are you adorning your table this fall? We have been in the house for a year and a half now, and I have to say I am pretty happy with the progress that we have made so far. This is what it looked like before…. 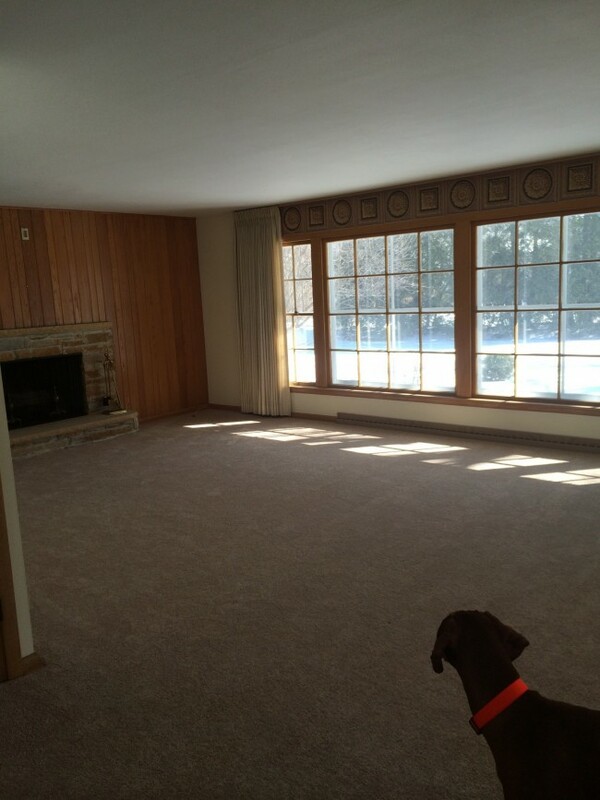 Right away we ripped up the carpet and had the floors redone. Then it was the tedious process of re-painting all the trim. We got the master bedroom done pretty early on, but I never took pictures. So finally I am excited to share! I know many people may think that pink is way too girlie for a master bedroom. But it is such a warm color. When the sun is shinning in it just makes the whole space feel homey. A lot of the furniture was brought from our condo, so we didn’t have to buy that many new things. My condo was feature on Apartment Therapy! Check out the post here! The arm chair was a DIY upholstery job. Check out the full post here. I made all the pillow myself. Ever in the market for some fun customer pillows? Give me a call! Wanted to share updates on bedroom. When I first moved in I found a fun vintage dresser that I re-did right away. 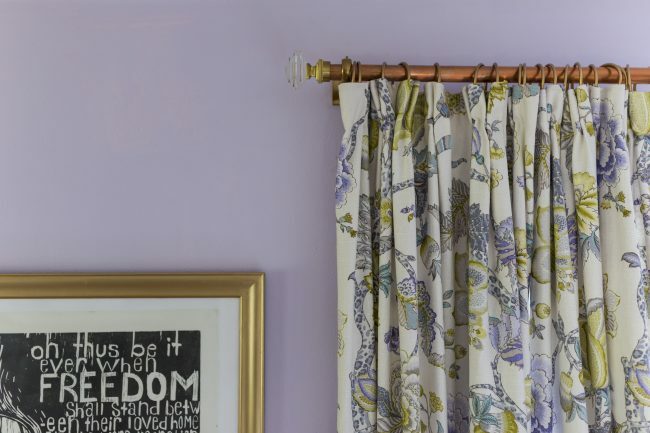 However it always takes time to find fun accessories to make the room feel more homey. Here is what the dresser looks like today! Just as a reminder, above is what the dresser looked like before the DIY. See the full post on how to here. come back tomorrow to see the full bedroom reveal!